“ How are conditions up the mountain?’’ I asked, lifting my head from the stoop caused by the heavy backpack. “ Not bad, lot of snow,’’ the athletic foreigner returning from Stok Kangri said, “ it’s all about timing and acclimatization really.’’ He looked at me squinting from strain. “ Are you acclimatized?’’ “ Oh yes,’’ I replied vaguely, “ have been around in Ladakh for almost two weeks.’’ “ Well, good luck then.’’ He walked on. It took me a few seconds to straighten up, feel the backpack’s load transfer to my hips and proceed slowly up the trail. That pack had no business being so heavy. All it carried was personal gear – water, sleeping bag, plastic mountaineering boots, crampons and ice axe. Yet it felt dead heavy. I was tired. The trail within ran back to Mumbai. Freelancing had changed my life. In times of inflation, my income reduced to a trickle. All I could do to keep the creeping sense of failure at bay was maintain another busy schedule around whatever I liked doing. Loneliness took hold. That was when Choszang Namgial, who I had worked with on a high altitude trek before, called up. He remembered my desire to visit Leh, attempt Stok Kangri. A Ladakhi, he was heading home in June to work the tourist season there. It appeared fine opportunity to find subjects for writing. Ladakh with few people in vast cold desert was engaging counterpoint to crowded Mumbai. I met Choszang in Delhi. We traveled by road to Ladakh, via Manali. On reaching Leh, I walked around for several days, meeting people and learning about their life. I spent time with Choszang’s family at his village. 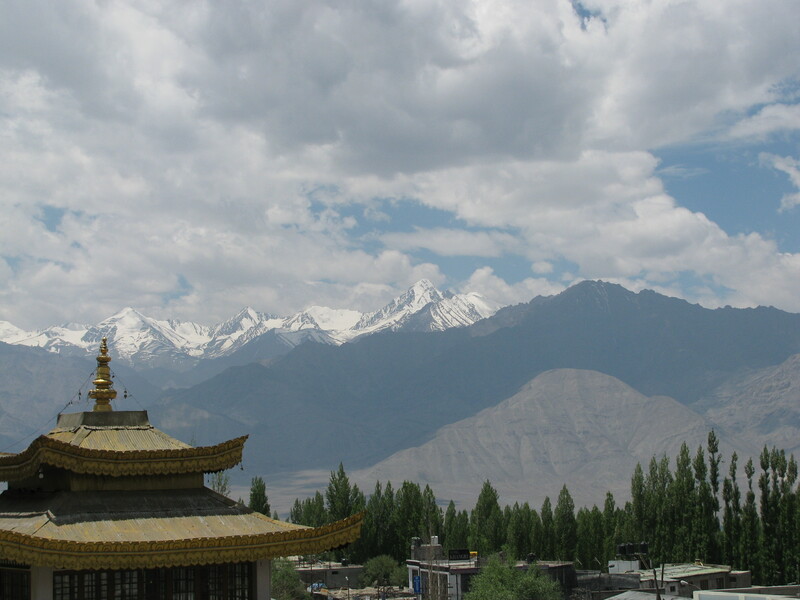 In Leh, I sipped lemon-tea and gazed at Stok Kangri in the distance. There was nothing to my activity that qualified to be acclimatization of the sort mountaineers desire. 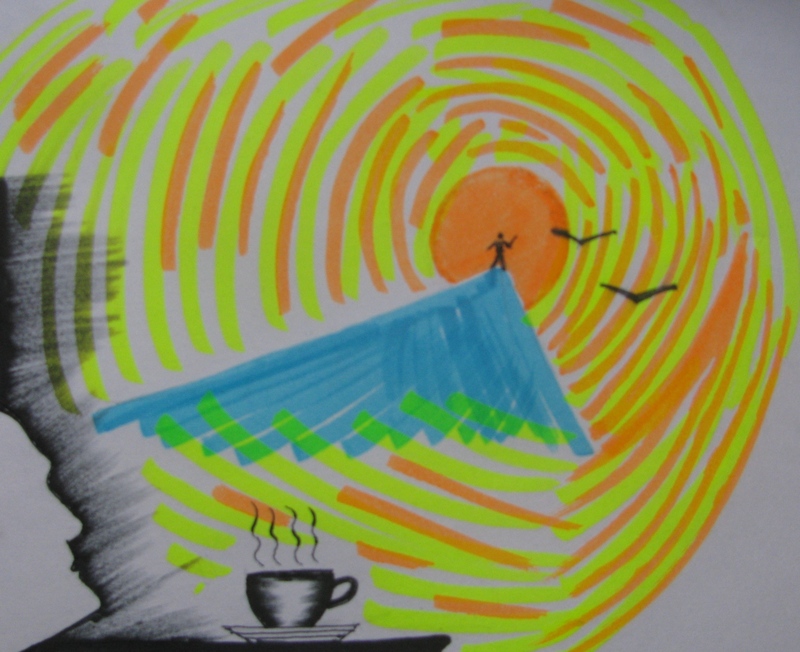 I was a wanderer with pen and note pad. Then a chance emerged to visit Pangong Lake. It was a surreal place; an expanse of blue water surrounded by barren brown hills. Couple of tea stalls, a curio shop, tents to stay in; groups of motorcycle riders living that much published image of travel in emptiness. An early morning, I jogged along the lake side and scrambled up the nearby hill. It felt good. However, neither that exertion nor the days spent walking around Leh did anything to radically change my condition baked by sedentary journalist lifestyle. Having been on expeditions before, I knew I was going in ill prepared. I felt thankful that Choszang and his friend would be accompanying me to Stok Kangri. The day before going to Stok village, we went with all relevant documents to the local mountaineering administrator, an elderly mountaineer of much repute called Sonam Wangyal. He had climbed Everest and also featured in those expeditions undertaken jointly by Indian intelligence agencies and Central Intelligence Agency (CIA) of the US in the 1960s, to Nanda Devi and Nanda Kot. Those were the years following China’s nuclear test in Tibet. The Nanda Devi expedition subsequently gathered controversy after it became known that a listening device powered by a radioactive fuel source, had been lost on the mountain. The story spawned media articles, books. Wangyal went over my papers. He wore a disinterested look on his face. It made me fear that the dreaded bureaucratic axe was about to fall on my request for permission to climb Stok Kangri. Then he suddenly looked up at Choszang and asked, “ He is Indian, isn’t he? Go…go…this is your country. Enjoy your climb!’’ The response delighted me. Mountaineering in India has long been wrapped up in permit raj and bureaucracy. Ever since I got to the top of an 18,500 ft-high un-named peak in the Zanskar Himalaya with my climbing club in 2004, I had wanted to clear 20,000ft. Eventually, I decided on the 6153m-high Stok Kangri, often dismissed by mountaineers for being a non-technical peak climbed by many. In the macho world of climbing, `non-technical’ is a major differentiator. It means that a given climb doesn’t engage the use of much gear. That is like being a boy in shorts amid muscled men with boots, ropes, helmets, machined metal components and all. As if this wasn’t enough, Stok Kangri had been climbed by many availing guided ascents. Mention its name to climbers; they look down their nose and sneer. I never told anyone of my choice but the likely criticism nagged in my head. At my club for instance, what a person liked to do had long been superseded by whether the mission was significant and challenging from climbing’s perspective. Looking back, I think I chose Stok Kangri for two reasons. First, my technical skills are limited; my physical fitness is more stretchable. So trysts with altitude made greater sense than agonizing over undoable vertical. Second, hanging out with climbers had dented my self confidence; battered my self esteem. A lot of it was my overactive mind. But some of it was definitely due to the climbing environment I was in. It wasn’t helping me. In fact, I had had to take time out and repair my self esteem. My Stok Kangri climb therefore commenced in Mumbai itself, erecting a protective barrier around my personal wish. Slowly I developed my defense – a person’s dream is a person’s dream and should be impervious to the comments of others. If others could be adamant about superlatives on vertical terrain and see that as sole perspective worth having, I had every right to enjoy the less than vertical! What I did not know was that in the thick of my rebellion, I was indulging my desire for distinction. It was vanity versus vanity. And in my case, a progressively tattered vanity for I was on the trail to Stok Kangri Base Camp (BC), hauling a heavy backpack of exhaustion. The cumulative effect of sedentary life, poor food intake, depression and a mind overactive through freelance writing – all had hit me. Late in the evening I called it quits just short of BC. I was too tired to cover the remaining three hundred meters or so. We camped there. It was trifle funny for above the adjacent ridge we could see people moving around at BC. They must have wondered why a tent had been set up so close, yet far and definitely not at the same address as everyone else was. We formally moved to BC the next morning for a good rest. I needed rest. That day in 2009 I knew how much my life had changed since the earlier Zanskar expeditions. I felt something had drastically gone wrong. I could neither forget the job security I had left nor could I whole heartedly embrace the insecurity I had traded it for. I was the classic in-between case and dwelling on it in remoteness depressed me further. Exhaustion however has a bright side. It is a great leveler; demolishes barriers, extinguishes pride. That and the general love for wilderness got me talking to the group of foreigners sharing the trail. At BC, we all met in one of those parachute tents that dot Himalayan trails, serving tea and food. The names have since dimmed in my mind, but there were people from Germany, England, US, Mexico and Netherlands. There was the former member of the British sport climbing team on her first foray to a 6000m peak. There was the former British banker, who had served in the property end of the business and seen it tank in the recession. He had then become a banking consultant to the shipping trade. But in the aftermath of the economic crisis triggered by sub-prime lending, banks became risk averse. Shipping on the other hand was a cyclical business. Eventually, he looked at his accumulated savings and said – let’s go climbing. That’s how he ended up at BC. One of the climbers had a particularly touching story. She liked climbing. After her husband fell ill, she had given up climbing to take care of him. Probably realizing the irreversibility of his ailment, the man later told her: don’t waste your life, live it. That’s the story as I recall it from imperfect memory. Early dinner done, everybody retired for a few winks of sleep. Past midnight we started for the summit, having dispensed with the idea of putting up an intermediate higher camp. It was snowing lightly and for me, rather cold. Within minutes of leaving BC, the water flow from my hydration pack froze. For the next four to five hours until the sun induced thaw, there was no water to drink. I could probably have drunk straight from the pack’s bladder but the one occasion I took my gloves off to adjust my trekking poles, my hands turned numb with cold. We kept a steady, slow pace. In a previous season, Choszang had climbed the peak nine times with clients. This season, he was already booked for another two. I wasn’t surprised when he told me that he wanted to do something else than just go up and down Stok Kangri and other trails in Ladakh. Around day break, we found ourselves past the usual location of the intermediate higher camp and looking up the final slopes of the peak. To reduce my tiredness, Rigzin who was Choszang’s friend, had put my boots and crampons in his rucksack. We conferred for a while on the fate of that baggage. I was fairly adept at kicking and cutting steps on snow to ascend and on Stok Kangri I was anyway following Choszang’s lead. We had made decent progress. So we decided to forget the boots and crampons and left Rigzin’s sack on a rocky ridge to be picked up on the descent. By now the sun was up. With it came the reflected glare from snow and a new problem. I couldn’t find my sunglasses. Embarrassed I said, “ let’s call it off, no glasses.’’ Choszang and Rigzin looked at me astonished. I searched again; found the glasses. Momentarily, I must confess, I had wished that the lack of glasses would be viable excuse for great mountaineer to hide his exhaustion and be off this peak that many climbed. Now I was back in play. Atop the last shoulder of the peak, before its summit pyramid, we decided to make tea. My small MSR stove went to work, melting snow for water. That tea was rejuvenating. The next half hour was careful going. Verglas – a glassy coating of ice on rocks – can be quite tricky. At around 8.45AM Choszang and Rigzin greeted the summit with loud Buddhist chants and an offering of a prayer flag. The duo couldn’t resist flair in the summit photo; in went the unused rope and our ice axes. The summit had a low wall of wind beaten snow and rock, beyond it the other side of the peak plummeted in a severe fashion. In the distance one could see Leh, its airport. I felt nothing of that 20,000ft obsession in my head. There was no elation, just thoughts of descent. Coming off the summit pyramid, we stood at the edge of the peak’s main face. Getting up that had been a series of traverses; now it lowered off in one swoop. It was an inviting glissade of few hundred feet save the first quarter, which ran steep. We shot off on our butts using ice axes for brakes; it saved much time. Back in Leh, I got myself an airline ticket to Delhi and stared down from the plane at the sea of snow covered peaks wondering where in that wilderness my first summit in Zanskar would be. Three days later, I was in Mumbai with resolution taken to eat at any cost. Without food there is no climbing. 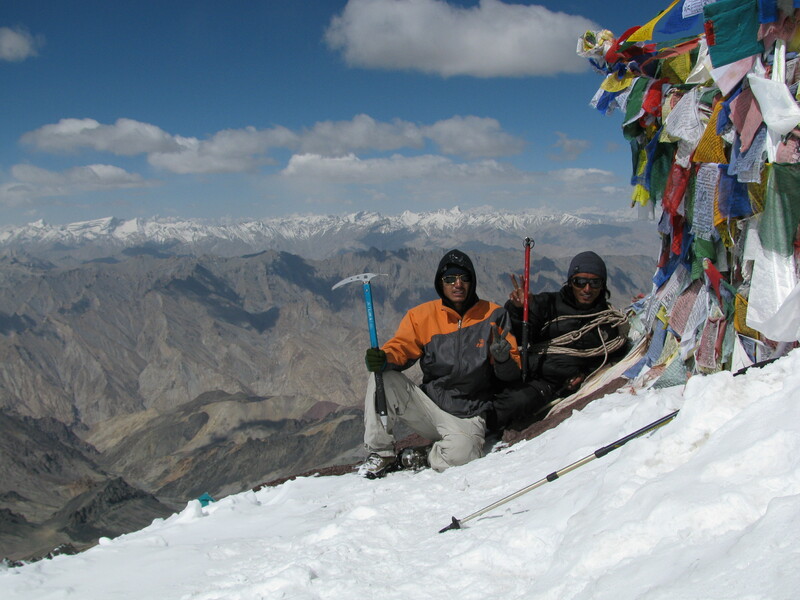 Most people come to Stok Kangri to access 20,000ft. It is as simple as that. In 2011, I reached the top a second time. In the months after my first trip, I had regularly worked in the outdoors. I was in much better shape. This time, I could go along as an unpaid help, serving a team of clients. We stopped some distance away from the summit as we felt the freshly deposited snow wasn’t well settled. On return, I spoke briefly to Sonam Wangyal about a new lot of over one hundred peaks opened up for climbing in Ladakh. They were yet to catch the fancy of climbers. Stok Kangri on the other hand, had become probably India’s busiest peak, a money spinner for authorities. Its attraction was the combination of a not-so-difficult climb and breaching 20,000ft. Indeed in 2011, the mountain’s base camp resembled a small city of tents. There were so many people out for an easy shot at distinction. Wangyal seemed tad disappointed by this limited appreciation of mountaineering. Next door to Stok Kangri is Gholap Kangri, which is slightly technical at the top and overall, below 20,000ft in altitude. Very few people go there. Everyone, including me, wanted 20,000ft. I listened to Wangyal. He was right. Vanity-climbs distort the purity of climbing. I didn’t tell that a few months after the 2009 climb, I was whipped by a 19,500ft-high peak in Uttarakhand, which I confidently went for having tasted 20,000ft on Stok Kangri. It was the first expedition I planned to a considerable extent. We got lashed by heavy rain, heavy enough to wash off approach trails and dump a lot of snow higher up. That delayed progress. It robbed us of adequate working days on the mountain. We reached high camp amid snowing. To reduce equipment weight at higher altitudes, I had left our second tent at lower camp. I crammed four people into a 3-person-tent at high camp. Short of space to lie down, I sat up much of the night. Outside, the snowing continued. Early next morning, one of us woke up too disinterested to proceed anymore. His boot laces had also frozen wire-like in the cold; they resembled the antlers of a deer. The remaining three, who went for the summit, were dismissed through a combination of difficult access, avalanching slopes (due to fresh snow) and no more days left to wait for the terrain to settle down. We turned back. It was a humbling experience. After that whipping, I stopped caring how high or low a mountain is. Every mountain region, every mountain therein – is unique. I also provide for time on the mountain and leave it to the peak to decide whether I should summit or not. In one of my later trips to Ladakh, I came across signs of Stok Kangri’s traditional image in climbing, potentially changing. 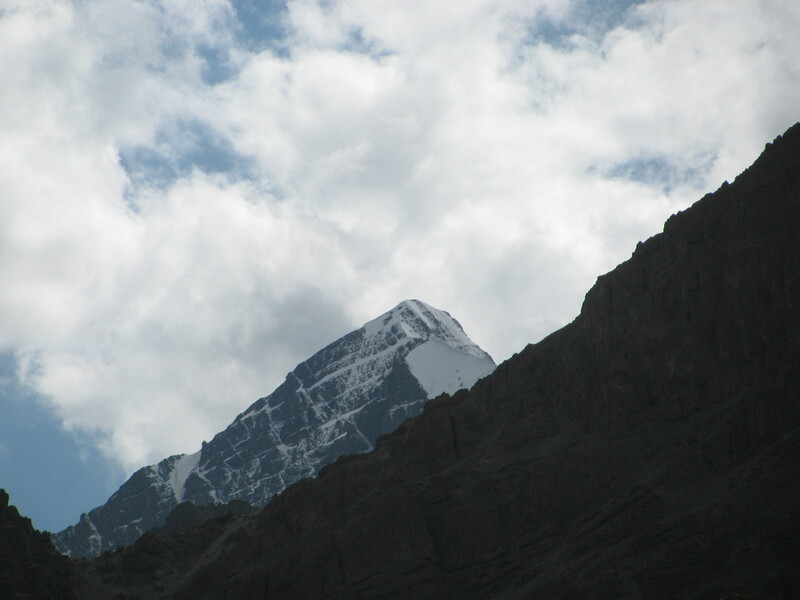 There were young Indian climbers, who spoke not of merely ascending the peak but ascending it by particular routes. Just as your fine day on a peak with summit gained is not how that peak is year round, every mountain feels different along its different climbing routes (Polish climbers in the Himalaya added winter ascents too, to the equation. For more, please visit https://shyamgopan.wordpress.com/2013/08/11/an-interview/). I am not a fan of speed climbing but I heard people talk of fast ascents up Stok Kangri. Months later on the Internet, I read about two young Indian women who climbed the peak alpine style with no porters or guides. These are all interesting departures from the norm. On my last visit to Leh, after a couple of days spent looking at Stok Kangri from town, I cycled to Stok village and had a cup of tea at one of the restaurants climbers frequented. I remembered Choszang and Rigzin, the trudge up the mountain and a cup of tea brewed high on its slopes. That was enough to make me happy. I then slowly cycled back.